The book sets out to help songwriters develop their own unique writing style while avoiding fundamental errors at each key stage in the song development process. “How [Not] To Write A Hit Song!” includes important tips on fixing and strengthening songs, along with a detailed checklist of 101 common mistakes that writers can measure their own songs against—no matter how ‘finished’ they think their songs are. Most songwriters have, at some stage, had to endure the disappointment of having their songs rejected and ended up asking: “Could I have done more to make my songs better?”. This book aims to help writers recognize weaknesses in their songs, so that they can re-work them, make them stronger, and hopefully achieve the breakthrough that they’re striving for. The book’s author Brian Oliver—who has worked with legendary songwriters such as Neil Diamond, Janis Ian, Albert Hammond, Chip Taylor and Gilbert O’Sullivan—warns that new writers’ chances of success could be hampered if they fail to spend enough time examining their songs and eradicating weaknesses in their songwriting. Oliver adds: “When a new song idea suddenly hits you—and everything comes together so quickly that the song almost writes itself—it’s very easy to fall into the trap of rushing straight into a studio and recording a demo. You then confidently submit the song to a music company believing it’s the best thing you’ve ever written … only to suffer the agony of having the song rejected. A 5-star rated book at Amazon, “How [Not] To Write A Hit Song! 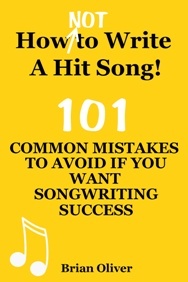 – 101 Common Mistakes To Avoid If You Want Songwriting Success” is available from Amazon as a US paperback, UK paperback and as an eBook from Amazon’s Kindle Store, Apple’s iTunes Store (Books/Arts & Entertainment/Music), Barnes & Noble’s Nook store, and from KoboBooks.